Konrad Zieba follows his shot. 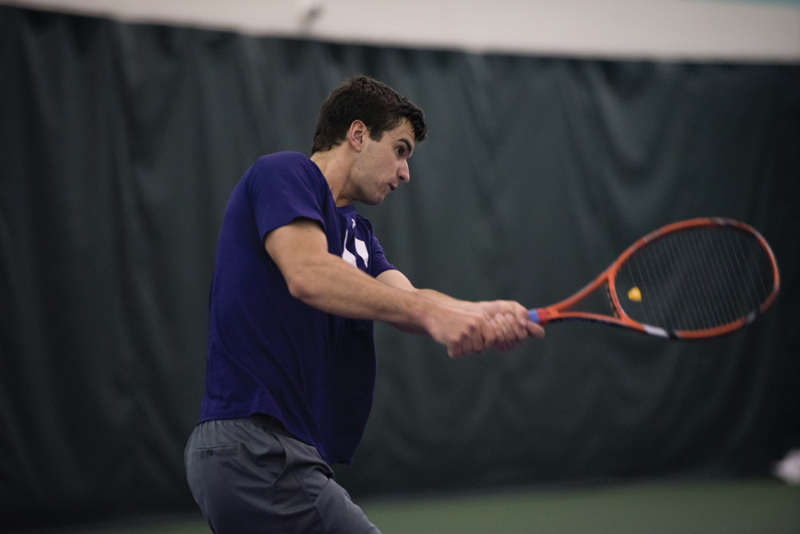 The senior fell in the deciding match against Michigan on Sunday. Northwestern showed signs of progress, but narrowly lost its chance at its first top-25 win since January in a loss to Michigan on Sunday. The No. 21 Wildcats (18-8, 6-3 Big Ten) lost a 4-3 squeaker against No. 14 Michigan (18-5, 7-2) on Sunday, two days after they cruised past conference bottom-feeder Michigan State (10-15, 0-9) 7-0. Though NU lost to the Wolverines, picking up three points against such a competitive team allowed the Cats to take away some positives. Against the Spartans, senior Strong Kirchheimer put himself in the history books as the winningest doubles player in program history with his 70th career victory. After winning the doubles point, the Cats put together a dominant performance in singles, losing just one set across all six matches to complete the sweep. Sunday was a different story, however. The match began when the Cats dropped a critical doubles point. The deciding set came at No. 1, where seniors Sam Shropshire and Konrad Zieba fell 7-5 to the No. 17 doubles team in the nation. That doubles point would end up being one of the deciding points. Swan, however, tried to avoid being dispirited by the situation, acknowledging that the individual no-ad sets can turn quickly. NU then won three matches in straight sets, while losing a pair, to knot the match at three. Zieba played his deciding third set at No. 2 singles with the match in the balance and lost decisively 6-0. This was the fifth match of NU’s season that came down to the final court; the Cats are 2-3 in such matches. Freshman Dominik Stary said he believes close matches come down to decisive deuce points. Deuce points are not played at many other levels of tennis, such as on the pro tour, where players must win consecutive points from deuce to take the game. In college however, the first player to four points wins the game. Stary said those high leverage points in particular worked against Shropshire and Zieba in their matches on Sunday. Though the close loss to a fellow conference contender was tough, Swan believes that with all his starters playing again, NU’s season can reach the heights thought possible at the start of the year.